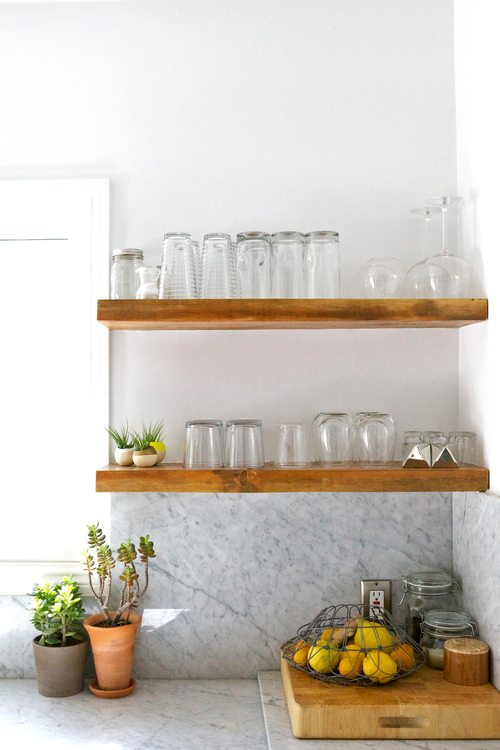 After Austin and I spruced up our kitchen in Virginia, something magical happened. You could say the DIY bug bit us, or we just got addicted to the always-surprising results that came from working with our own hands. Austin is pretty handy but I’ve had to learn my skills from scratch, and yet we both knew we wanted a fixer-upper when it came time to move to Denver. We vetoed (okay, I vetoed) countless homes because they were in “too good” of a condition – some partially renovated, others newly built. Austin wanted something cheap, and I wanted something we could make our own. That was especially important when it came to our future kitchen! 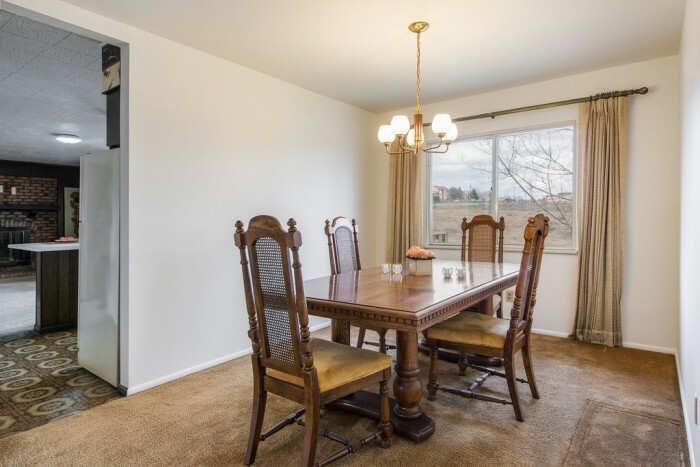 The floor plan was open to the family room, and the wall behind it (on the left, below) separated it from the dining room. I’ve already share my feelings on the…erm, decor. It was certainly usable, and we did use it for the first few weeks. But man, it was ugly. And as soon as the ink was dry – while we still lived in Virginia — I had begun our kitchen renovations plans. Size. Up until now we’ve lived with teeny tiny kitchens that have driven us bat crazy. This is going to end now. Openness. We wanted an open floor plan that allowed for entertaining but also kept us in close proximity to our son while we cooked. 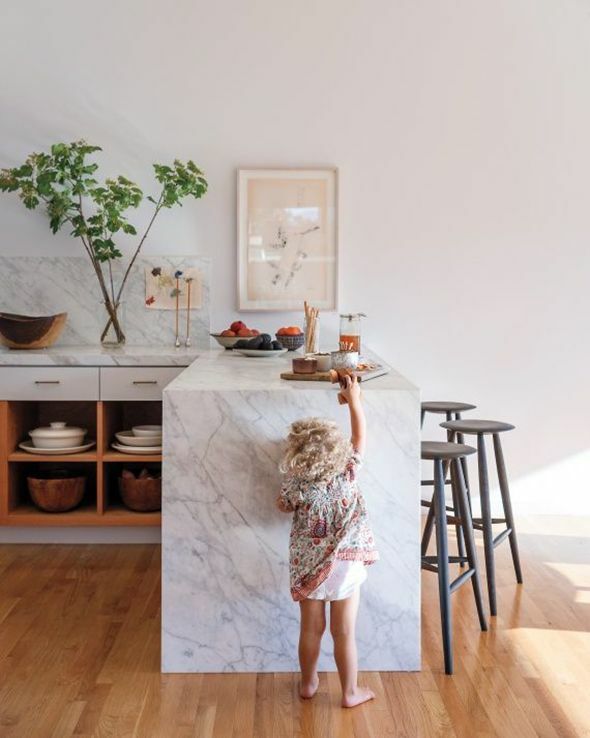 This desire for openness also meant we would forgo upper cabinets entirely – I really wanted the kitchen to blend seamlessly and naturally with the living space. Brightness. This is the general theme for our new home, both because of my personal taste and the fact that the house is unfortunately rather dark. 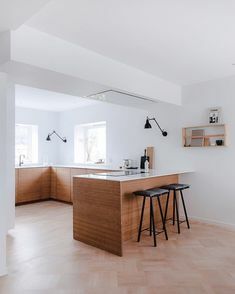 I love white-on-white kitchens and knew right away this was the look we’d go with. Cost, obviously, as we are on a very tight budget. That being said, there were some splurges we knew we wanted to make in the kitchen because it’s literally the epicenter of the house. We managed to pull some major savings with the cabinets, refrigerator, backsplash, and shelves however (which I’ll get into later on). Dana Miller has done a great series on Ikea kitchens and there’s a wealth of info on the internet about how to design and shop for them, so I’m not going to go into it very much. But we did use the Ikea 3D kitchen planner (a.k.a. the most inept and buggy software I’ve ever encountered that will make you want to strangle anyone in a blue and yellow striped shirt) to plan out the size and placement of our cabinets. I just tried to pull up our model so I could share it with you and of course…it’s not working. Surprise, surprise. Aways, I modeled it in Sketchup since I like seeing things beforehand so I can be 100% about any design decisions. My plan was to remove the wall separating the existing dining room and kitchen and push back the kitchen into that space. 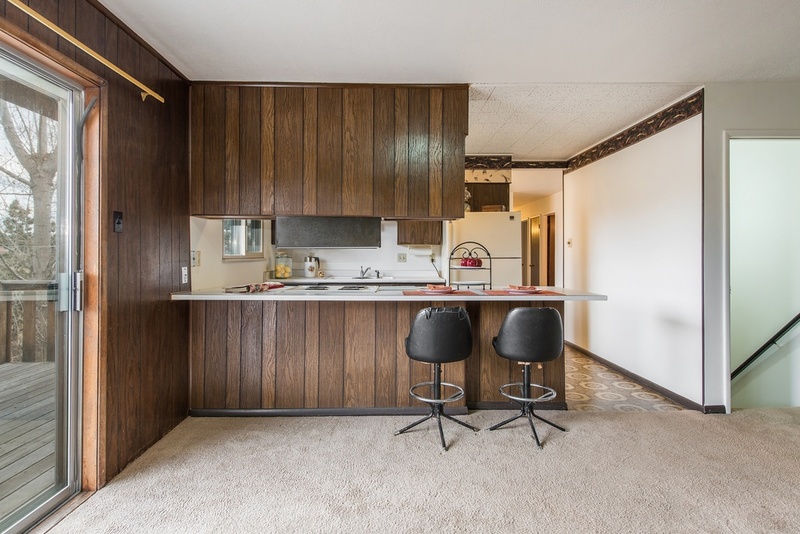 The cabinets are in a U-shaped layout, with a bar and stools on the back of a peninsula. I really like the look of continuous, horizontal shelving so I added that in as well. SO with the finishes and if everything goes according to plan, it will look like….this! Still not sure what I’m going to do behind the bar — the hexagon pattern was something I was toying with, but I think it might be too busy. I’d love to hear your suggestions! Stay tuned as I’ll be sharing our demo experience very soon! I’d love to hear your thoughts on the design. 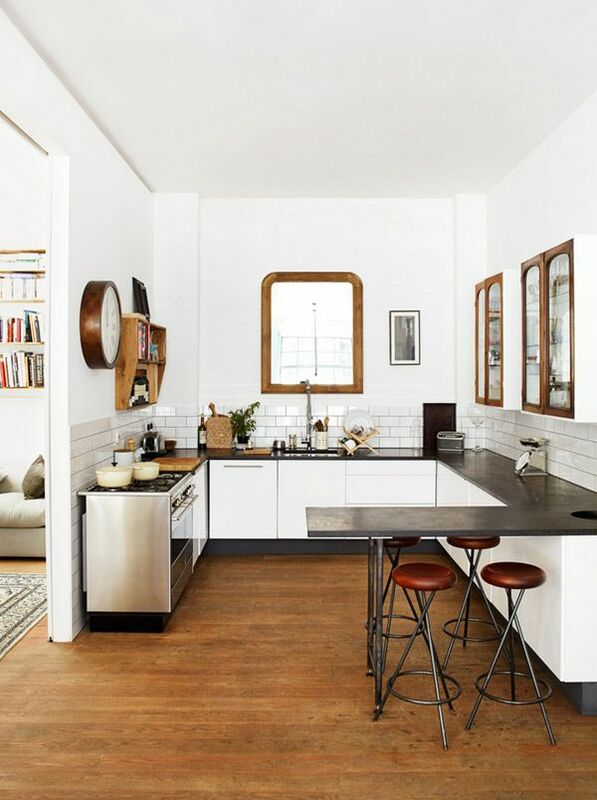 How do you feel about white-on-white kitchens? Should I have mixed it up with more contrast? 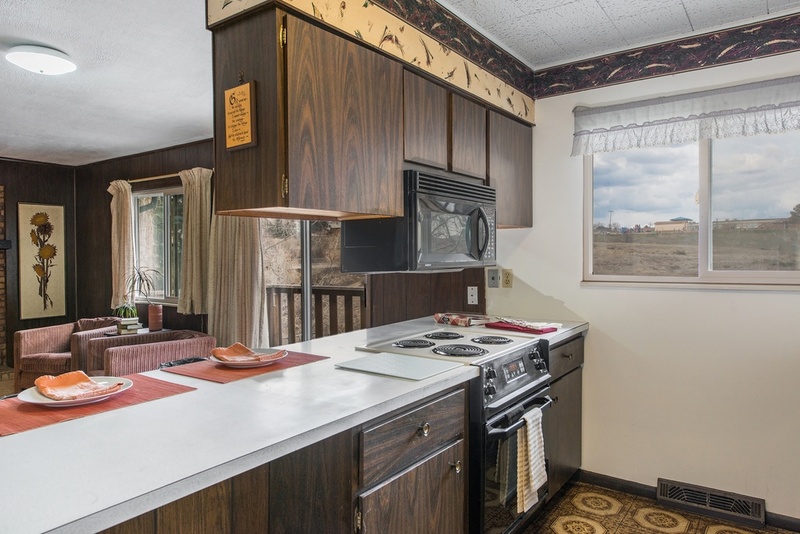 And what about mixing brass with stainless steel appliances? Lemme hear it! Love the new kitchen, the all white and the brass! I can’t wait to see the final product. Thanks Lin! I’m hoping it will be nice and bright. We’re in the home stretch now — with luck we’ll be done by Thanksgiving! i know its been done and done, but maybe a wood panneling/planking on the peninsula as opposed to the tile if you feel its too busy. love the whole design+ cant wait to see the finished product! Thanks Shannon! I’ve been toying with that idea, too. I’ll probably render some different ideas and maybe even have people vote? Yes! Cant wait to see. Love the plan! 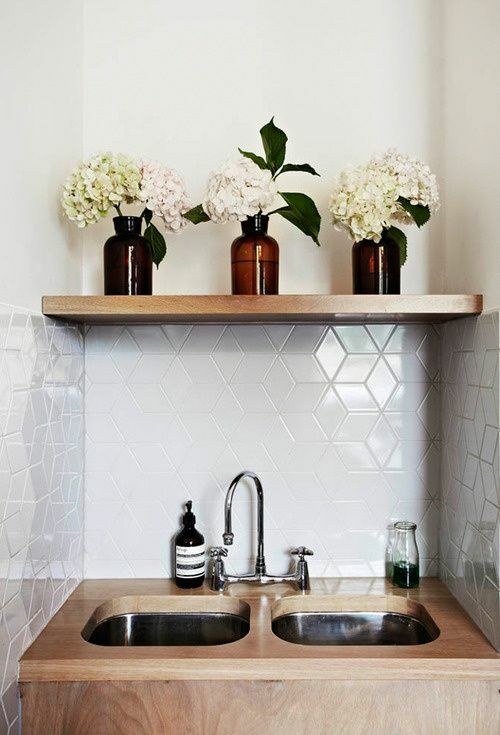 I agree about the hexagons — everything else is so minimal that it kind of steals the spotlight. I like white on white and don’t mind brass & stainless! 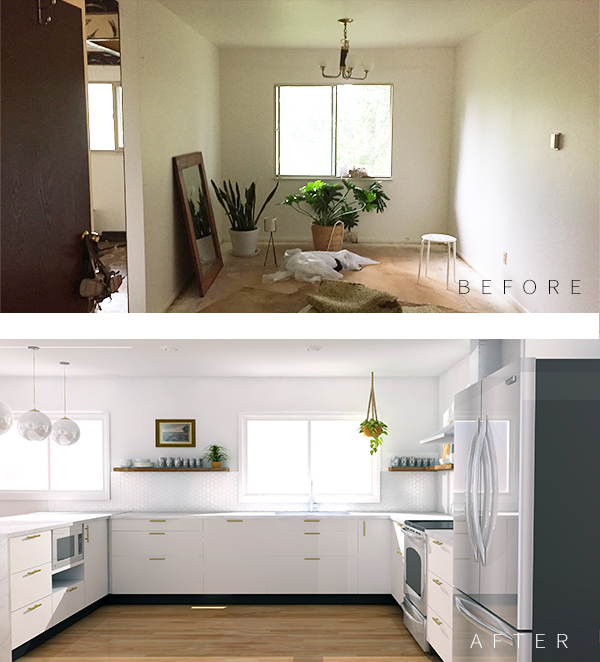 Ok – now can you plan my kitchen reno!?? 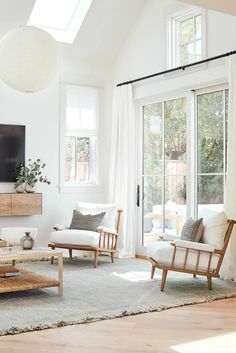 I actually love the hexagon but do agree with it maybe being a bit too busy, what about doing the hexagon with different whites and grays instead of the color? That way it still adds interest but still blends. I also love the reclaimed wood planking idea maybe gray or white washed. I can’t wait to see it all complete!! Love these inspiration shots! 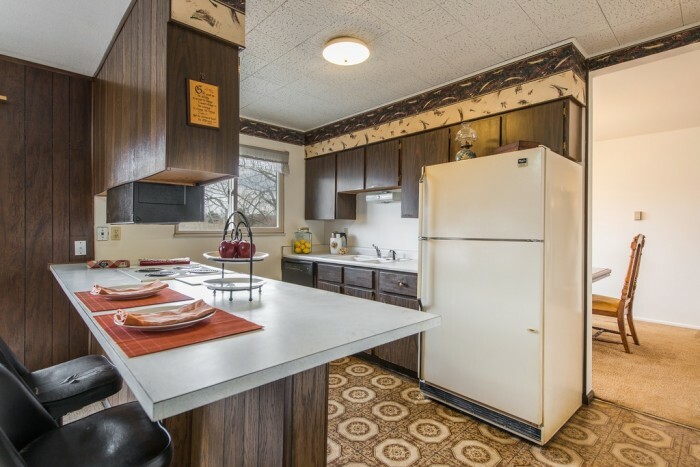 We’ve got a kitchen in desperate need of an overhaul, so I can’t wait to see what you do with yours! This looks really exciting! Do you mind my asking what program you use to do your renderings? Just curious, and sorry if it says somewhere. Thanks! Sure thing Tracy! It’s Sketchup, which is a free software owned by Google. You can read about it in this post. I just came across your blog and I lOve it! It’s so fresh and simple.. like a breath of fresh air! ha! I’m curious because I’ve been playing around with sketch up. Are the after’s something you created in that program? If so, do you mind sharing with me what part of sketch up you used to create that? are you a pro member? I haven’t figured out how to make that rendering of my sketches, but I see them everywhere! thank you so much! Hi Stephanie — thank you so much! I wrote a post about sketchup last year and there’s some helpful info in the comments if you want to take a look (you’re right, that is the program I use). I’m not a pro member even though I use it professionally — for what I do, it’s just not necessary. I do use a plugin called Podium which makes it photorealistic — that’s what you see in the post above. Let me know if you have any other questions or if I can help in any way! Once you get over the hurdle of learning it, it’s so much fun to use :). Hi Anna. I love your kitchen. Will most likely have mine look very similar. I really love those pecan floors. What are the exact brand? Thanks Sarah! They are Southern Pecan Natural from Home Depot. The link is here (it’s an affiliate, FYI). 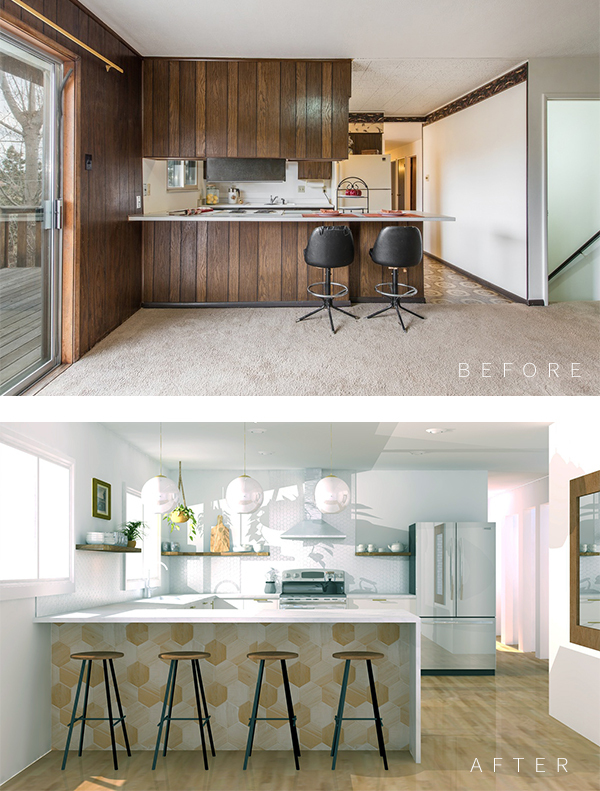 Beautiful kitchen redo! What brand of grout did you use? I know you said the color was Platinum. Thanks! Thanks Emily! The brand is Polyblend and you can find it at home depot. The link is here. Hi Jessica – I use Photoshop to create all my mood boards.